Darick Robertson Transmetropolitan #3 Page 3 Original Art (DC, 1997). Spider gets pelted with snowballs in this chilly page from the popular series. 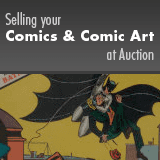 Image area measures 9.75" x 15" and the art is in Excellent condition. Signed by Robertson in the bottom margin.